I ought to be the last person to get wade into the waters of arguing over definitions. By definition I loathe quibbling over definitions. But c’mon, Chronicle of Writing Poorly But Great at Oversensationalizing Headlines About Higher Education, I cannot event tell what topic el Chrono is writing about. Blame it on the weak wifi at the conference hotel? Bad appetizer at the opening reception? After the opening of Open Education 2014 of which I am safely in British Columbia attending virtually via tweets, the Chron declares via headline that Open Education has a Publicity Problem. Before I even get below the digital fold, I frankly do not know what they are writing about. That’s a writing problem. 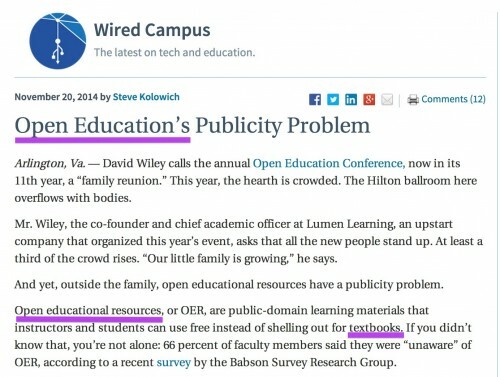 From the headline Open Education has a publicity problem. Do they mean “a collective term to describe institutional practices and programmatic initiatives that broaden access to the learning and training traditionally offered through formal education systems” (wikipedia)? Maybe not. Try this one on again. Open educational resources, or OER, are public-domain learning materials that instructors and students can use free instead of shelling out for textbooks. Does The Chronicle mean “freely accessible, openly licensed documents and media that are useful for teaching, learning, and assessing as well as for research purposes” (wikipedia)? OERs are not public-domain, works “whose intellectual property rights have expired, have been forfeited, or are inapplicable” (wikipedia). And at the end of that slippery sentence, the writer compares OERs to textbooks. Just what the bleep are they writing about? They are hanging out with David Wiley, he has some clear ideas on the subject. The blaring problem is the Babson survey report that 66% of faculty (who were part of the survey) are unaware of OERs. I dunno. I think a 33% awareness of a term that has only been in use within the last decade is pretty damned good. Especially since even professional writers on the subject cannot even figure out what they are. Do you want to know who has a publicity problem? Show me how many students rave about the value of spending hundreds of dollars for a single textbook. Of course it’s not a huge problem for the bookosaurouses; they do have all those funds for PR departments. But the Chronicle? They have a writing problem. And this is not just a quibble; they influence the field, just witness the confusion in the comments open that article. People go from their awareness of OERs to talking about textbooks. OERS are not Open Textbooks are not Open Education. There is a relationship, not an equivalence. Let’s help out the Chronicle. Let them know there is a nifty online encyclopedia they can use as a starting point. 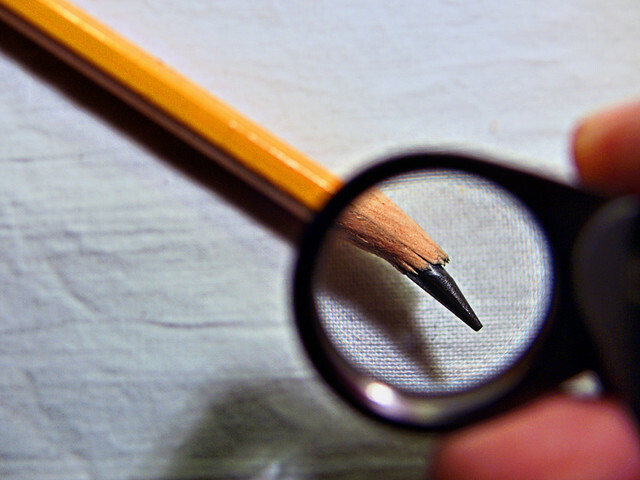 There are OERs for composition as well as Open Textbooks for teaching composition. Heck there are even MOOCs. I love what you’ve done with the place. The rug really pulls the room together. And you are right regarding the Chronicle… education journalists need a press release to copy out really. On a larger scale, I think CHE is falling into the same trap as the 24-hour news channels did. The need to publish a constant stream of “engaging” (pronounced “outraging”) content has blurred the lines between actual reporting, travelogue, and opinion. It is a writing problem that we can’t tell on the way in to the article what we’re going to get, but I suspect it’s a pace problem that the articles just aren’t as thoughtful as they used to be, on average. And if I never read another one of their “blog posts” in the format “here’s 3 links and a plea to post something to the comments feed” again, it’ll be too soon. I saw your article (http://cogdogblog.com/2014/11/20/writing-problem/) while looking up about online courses. I think you will find CourseBuffet a great resource for your readers. Our mission is to organize MOOC courses better. We put MOOCs in a course catalog format similar to what you will find at a US University. This means grouping similar courses together and in relative order. This makes it easier and faster for users to compare courses and plan the order they might take courses. I hope you will find CourseBuffet worthy of being listed as a resource on CogDogBlog; for your readers who wish to keep on learning. If you have and questions or feedback please let me know!